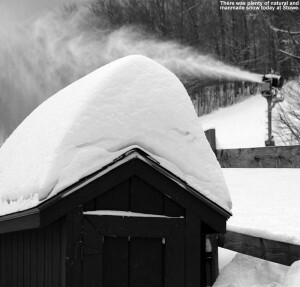 I saw a couple of new offerings mentioned on the Bolton Valley website this morning as they continue to expand their terrain – the opening of the Snowflake Lift and the Hard Luck trail. Ty was away at Kenny’s, and E and Dylan had to take care of some shopping for an upcoming birthday party, but eager to check out the expanded terrain, I decided to head up to the hill in the afternoon. We’re experiencing warmer temperatures right now ahead of the next incoming storm, so it’s been quite comfortable out there. It was around 30 F at the house when I left at noontime, and mid 20s F up on the hill. It was cloudy, but unlike the persistent snowfall of yesterday, there was only the occasional spit of snow in the higher elevations. Like yesterday, I was able to grab a parking spot in the top lot from a car that was leaving, and after getting on my gear I headed right over to catch a ride on Snowflake. While on the lift I was able to watch a snowcat working on the Butterscotch Terrain Park – all the snow piles were being flattened, and they play to open it tomorrow for skiing without features. Only Timberline Lane and Lower Villager are open on the skier’s left of Snowflake, so I opted for Sprig O’ Pine to get me down to the Vista Quad. The snow on Sprig O’ Pine was nice, not as soft as natural snow of course, but good because traffic has been minimal there. 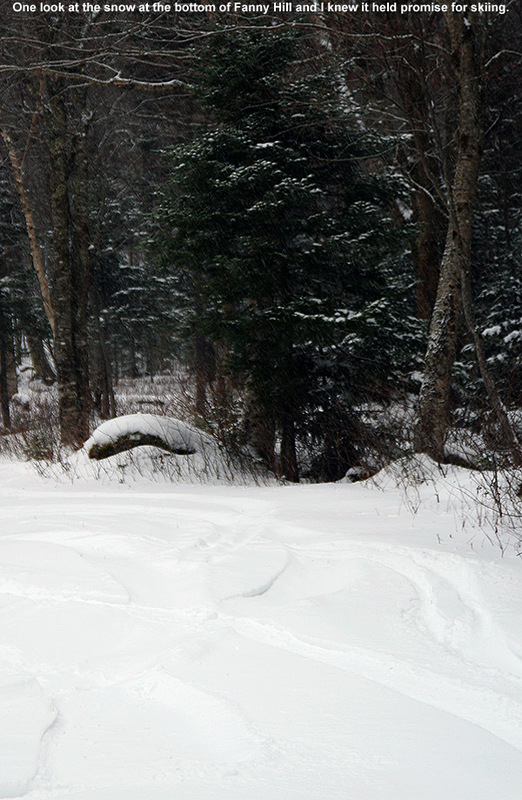 I took the alternate loop out toward Deer Run, which did have natural snow – that was really soft, and as it’s a protected area there were some beautiful accumulations of snow on the trees. There was a lift queue of probably a couple minutes for the Vista Quad, but I jumped in the singles line and got right on. 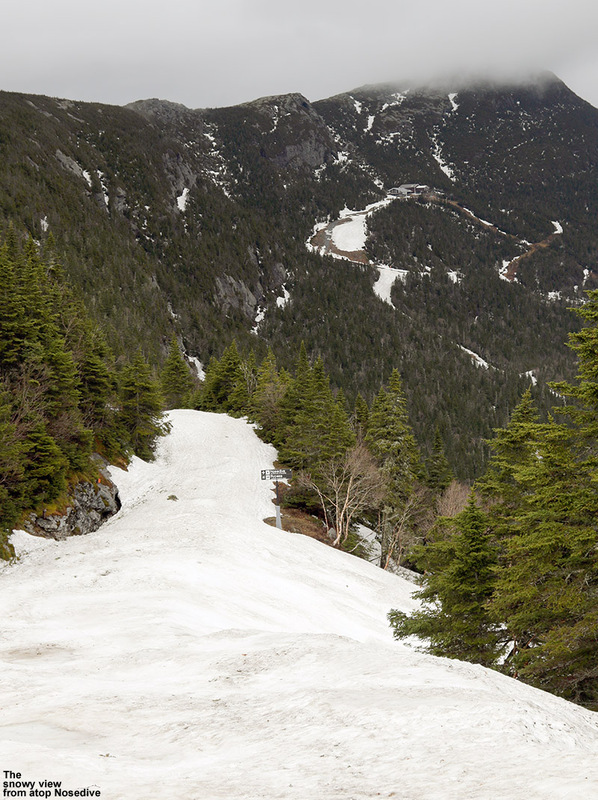 I found good snow along the skier’s left of Spillway Lane, and then dropped into Hard Luck to see how it skied. 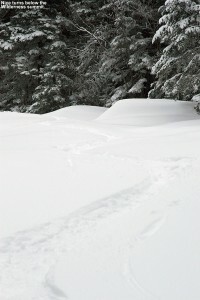 It was somewhat firm manmade snow in the top section, although skier traffic had created deposits of soft snow along the edges. 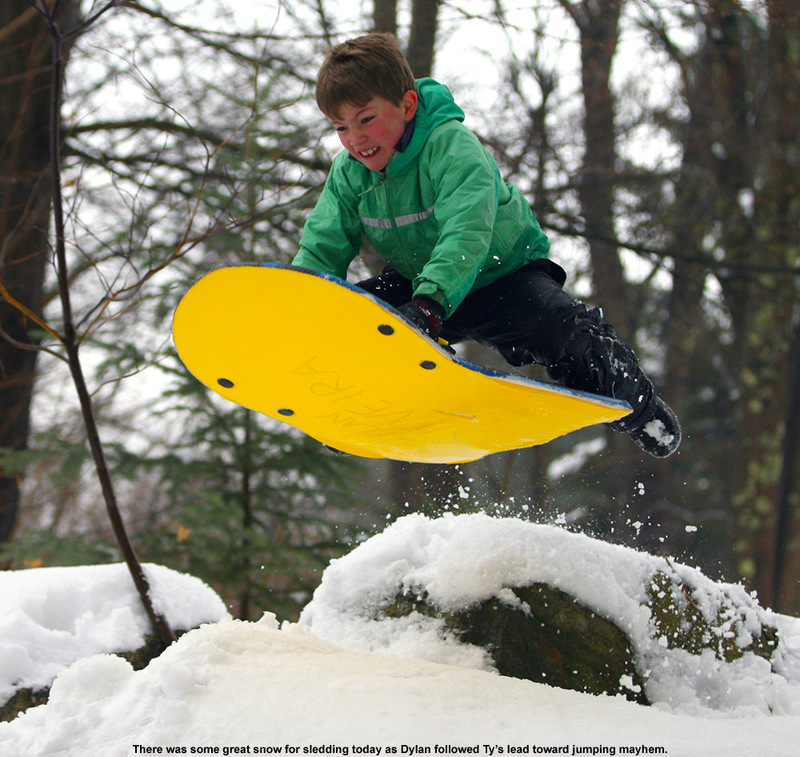 As is sometimes the case with manmade snow, the loose material was a lot like sand, but at least it was soft. 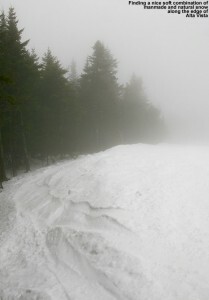 The bottom half of Hard Luck appeared to be mostly natural snow – it was much softer than what was above as one would expect, but some areas of poor coverage has to be roped off. Below Hard Luck there was actually some nice untracked powder remaining on the skier’s left of Sherman’s Pass – people just hadn’t been venturing that far to the left. On the lower mountain I skied Beech Seal, which had some excellent areas of soft, contoured snow along the skier’s left. I was eager to hit that again on my next run. I checked out Alta Vista next, and the line along the skier’s left was in good shape. Had it not been for the occasional touching down onto firmer snow, it would have been great. Sherman’s Pass was in decent shape, with the occasional patch of slick snow that could be avoided, and turns were very nice once I got to that area below Hard Luck and followed the same route down Beech Seal. I’d explored the offerings that I wanted to hit by that point, and decided that I’d tour over to Wilderness to finish off the day with some powder. I headed down Alta Vista again, really happy with the way I hit that skier’s left with some aggressive turns. My legs felt warmed up and stronger by that point. On my previous run I’d seen that all the lower routes over to Wilderness were roped off, so the Upper Crossover route was the best remaining option. I knew that anything steep was going to be too much for the current conditions, but I suspected that Peggy Dow’s would be passable, even if I found nothing good above the Old Turnpike area. I caught the bottom portion of Vista Glades, then connected onto Upper Crossover to switch over for the ascent. 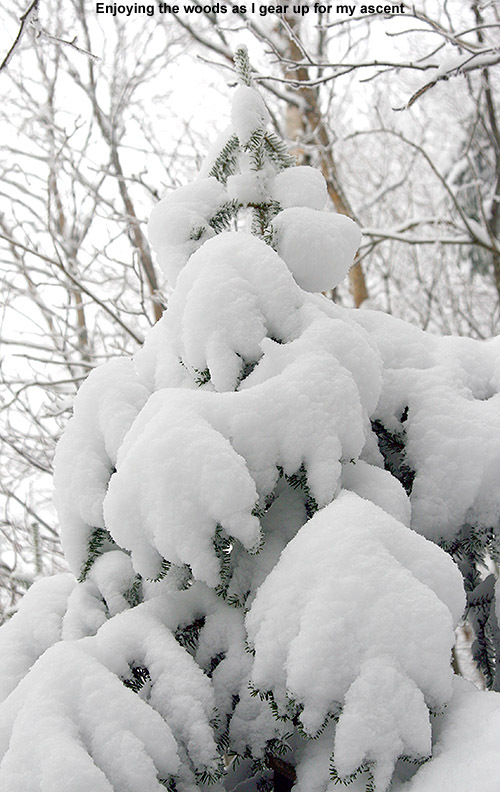 While putting on my skins, I had time to enjoy the snowy views, which included evergreens that were really starting to take on some healthy accumulations of powder. On the ascent toward the Wilderness Summit, I generally found snow depths of 6 to 11 inches in spots that weren’t scoured by the wind, so there were indeed some good pockets of snow up there. Despite intense scouring at the top of Bolton Outlaw, the Wilderness Summit itself was sheltered from the wind and had some nice snow. 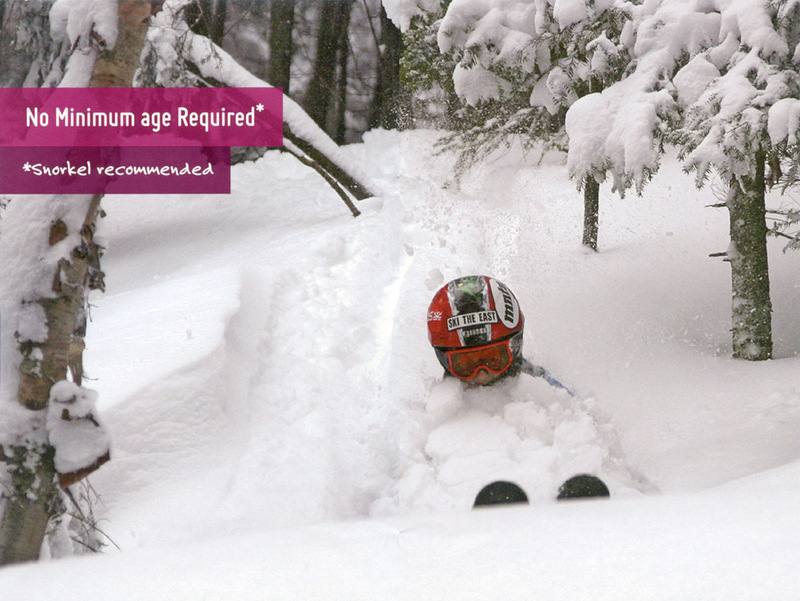 Indeed, all of Peggy Dow’s above the first big bend had plenty of deep snow and some great powder turns were made. Once I neared the junction with Heavenly Highway I initially went wide right to avoid the icy, wind-scoured face, but I saw that another skier had taken the chute that bypasses it on the left. 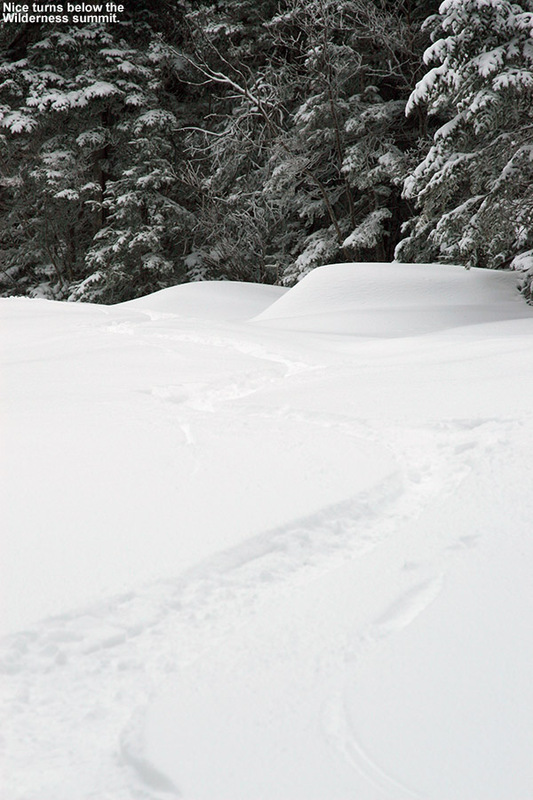 That area was protected from the wind, so I followed that skier’s tracks and found reasonable coverage. Down on Old Turnpike the first couple of steep corners were naturally icy, but there were lines to bypass the most exposed spots, and soon I was down into the protected lower areas that we skied yesterday. I actually used the same route as we did yesterday, until I decided to mix it up and check out the Wilderness Lift Line instead of Lower Turnpike. The lift line was actually fine, even if didn’t quite have the protected coverage of Lower Turnpike, and there were several tracks on it. From the base of Wilderness, I headed back to the car and had time to do a little long-range shooting with Chris’ Canon EF 70-200mm f/2.8L IS II USM paired with his Canon Extender EF 1.4 III. That’s a full frame equivalent to 448 mm on my 30D, so there’s some great reach with that combo, and you’ve still got f/4 speed. It’s certainly not a setup that you can carry lightly though; with the lens hood on it’s 15 inches in length and the weight is around 6 pounds, so you definitely know it’s there. Looking ahead, the next winter storm of note is a coastal system that is expected to affect the area tomorrow afternoon into Monday. 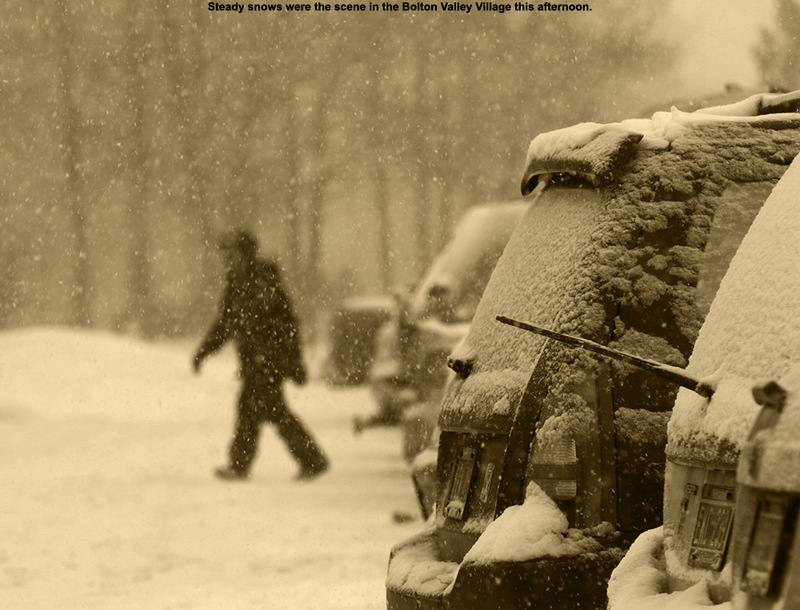 The valleys will probably be a bit warm at the start, but the mountains look to do well; the point forecasts from the National Weather Service Office in Burlington currently call for 3 to 5 inches down here at the house, and 3 to 7 inches up at Bolton Valley. 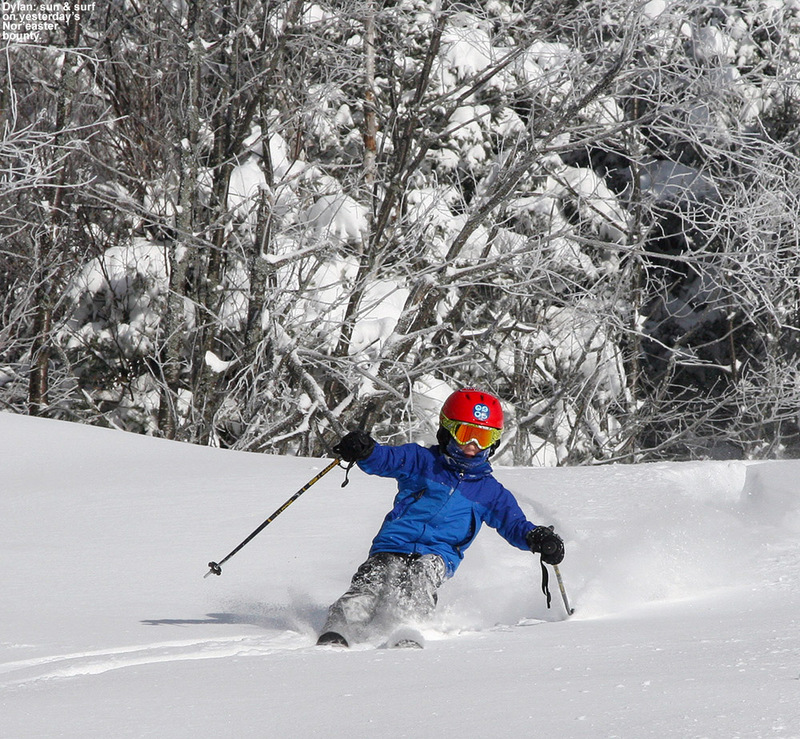 An Alberta Clipper hit the New England region yesterday, dropping up to 10 inches of snow in Northern Vermont and continuing the process of covering up surfaces that were hardened by the big mixed precipitation event earlier this week. We had a couple additional rounds of light snow prior to yesterday’s storm, but there still hasn’t been enough new snow to resurface steep, icy terrain. 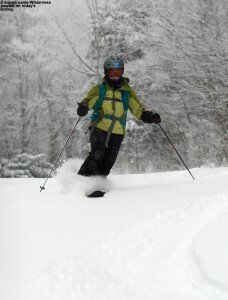 As such, Bolton Valley only has their core set of trails open on the main mountain. I had fun on those trails on Saturday, but it’s still a limited number of options for runs, and with a good amount of new powder available, we decided to earn some turns and get some fresh tracks today. The Wilderness Lift isn’t running yet for the season, so we decided to pay that terrain another visit. 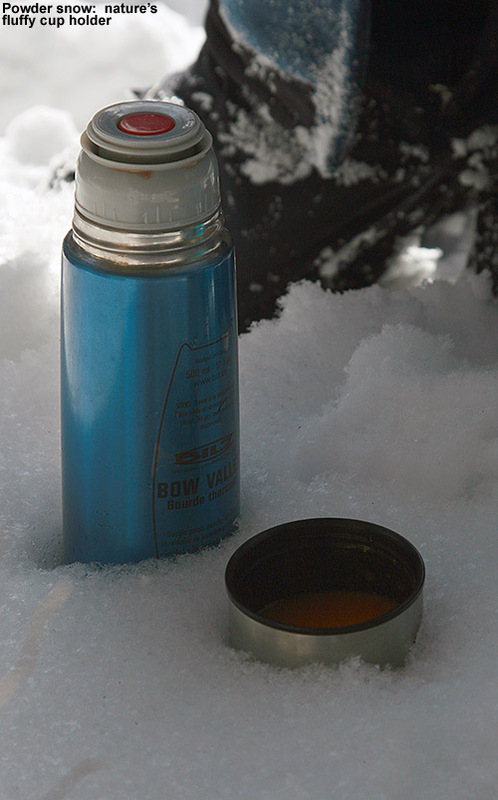 Ty, E, and I had a great time there back on November 30th, and with the current firm, icy subsurface, we knew that the moderate pitches and relatively high elevation of the lower Wilderness area trails would be a good bet for powder skiing today. Now that we’re back into a more consistently wintry weather regime, the Northern Greens snow globe has kicked in, and we’ve had a fairly consistent supply of light fluffy snows in the air. It’s not really substantiating the base snow, but it is creating quite the quintessential Vermont winter scene for holiday visitors, and it’s topping off the slopes with some serious softness. Another burst of flakes was just kicking off when we left the house to head up to the mountain today after lunch, and the snowfall intensity increased as we headed up toward the resort. Up in the Village we encountered temperatures in the low 20s F and steady light but accumulating snows. There were plenty of cars in the parking lots, but since spots were opening up with early afternoon departures, we secured a spot right at the north end of the upper lot. We headed up to the landing on the northwest corner of the main Village complex, and got our gear ready. 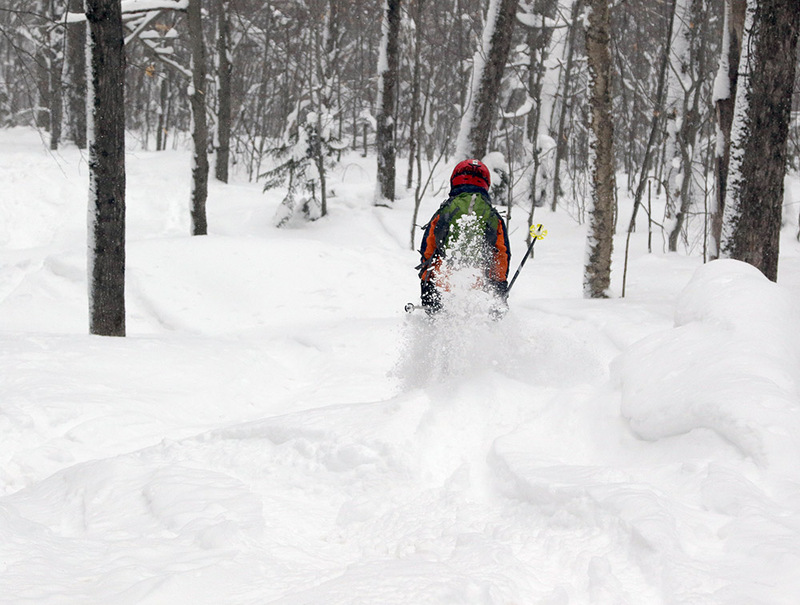 Quinn passed through and gave us a heads up on conditions – below the powder was a slick, icy base as we’d suspected. We followed a nice skin track up Lower Turnpike, and there were a few sets of tracks on the trail, but a lot of fresh snow remaining. A couple of guys came down the trail and let us know that the steep upper sections weren’t worth the effort because of the ice, right in line with what our beta was suggesting. Depth checks at the start of the ascent revealed 5-6” of powder, which represents the accumulations from this recent clipper and the couple of small bouts of snow that preceded it. We skinned up among steady flakes, enjoying the snowy views of evergreens around us, and when Dylan called for a break ,we stopped at the first crossover to the Wilderness Lift Line at 2,500’. 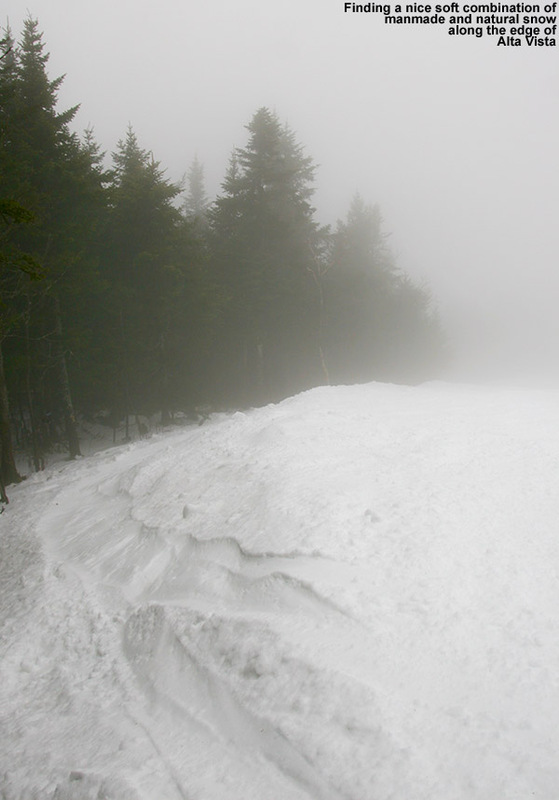 I checked on the conditions on Wilderness Lift Line, and found that it had been hit with wind harder than our last visit – it was clear that although Turnpike had a few tracks, it was the better choice for snow quality. With Ty leading the charge, we continued on up to ~2,750’ before finally putting a halt to the ascent because we were getting into icy, scoured terrain. 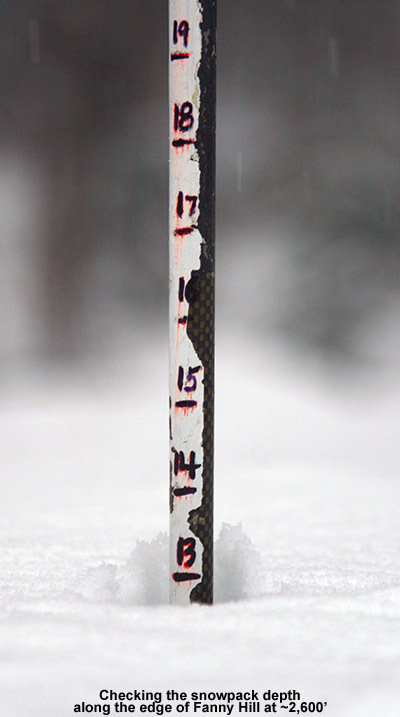 The snow depth up at the point had increased to roughly 7 inches. The descent was a peaceful glide through silky smooth powder, with only the occasional touchdown on the old base. 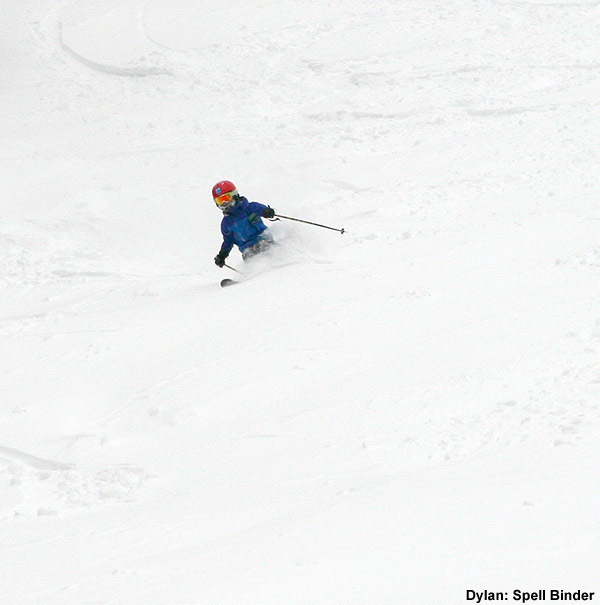 The pitch and powder were essentially perfect, although the powder was deep enough that Dylan would sometimes have difficulty keeping his speed up. Dylan’s Telemark skis (Völkl Gotama Juniors) are fairly wide, but nothing like the Black Diamond Elements and AMPerages that E and I were using, and momentum issues aside, you could really feel the way the floatation afforded by our fat skis was letting us ride a bit higher and faster in the powder on those lower-angle pitches. I was curious to see if E had noticed the effect, so I asked her how she felt about the speed of her skis on the descent. She initially thought that they were very fast, and figured it was because they haven’t been used for too many outings and had been waxed. I explained that a good part of that was actually from the floatation that the skis provided. Ty invented a new descent technique where he would kneel all the way on the tips of his skis with both knees, and in the powder it gave the illusion that he was just kneeling in the snow with no skis and flying down the mountain. We’ll have to get some video of that at some point, because it’s quite a hoot. We ended our descent back at the landing on the northwest corner of the Inn, and discovered that it’s a great spot to be if you want to catch up with what’s going on at the resort. After seeing Quinn at the start of our tour, we ran into Cam and later Josh at the end of the tour. We got to chat about the current state of the conditions, being happy that there are still great options out there for powder, but hoping that we can get some larger storms in here to start building the base. We’re in an OK pattern for maintenance over the next couple of days, and there’s a chance for getting in on snow from a coastal system as we head into Sunday night. We’re certainly a bit fat to the northwest to really jackpot with that storm, but if we can get some base-building synoptic snow out of it, it will really be a step toward terrain expansion. 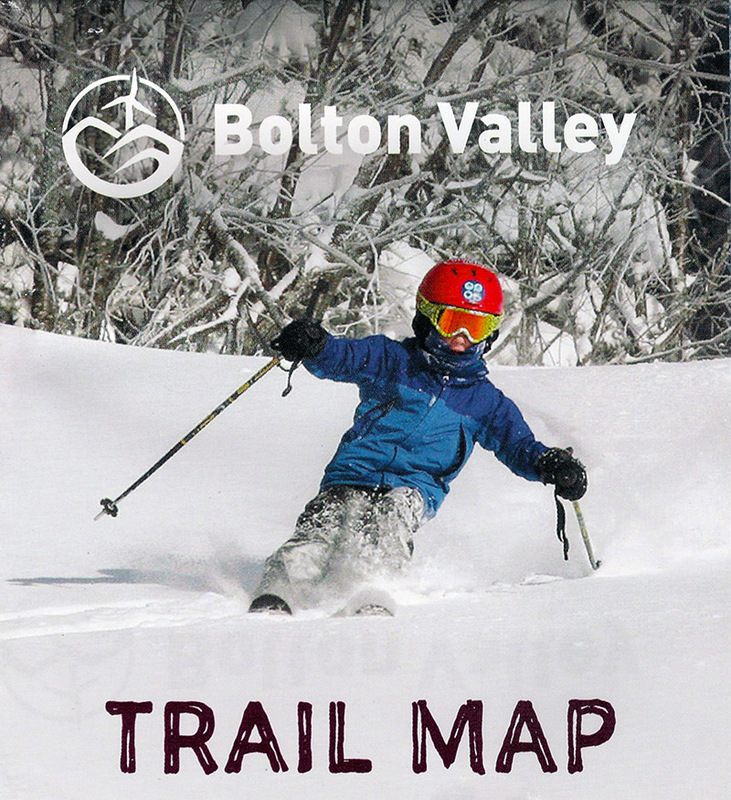 Congratulations to Dylan for making the cover of the new 2013-2014 Bolton Valley alpine trail map! 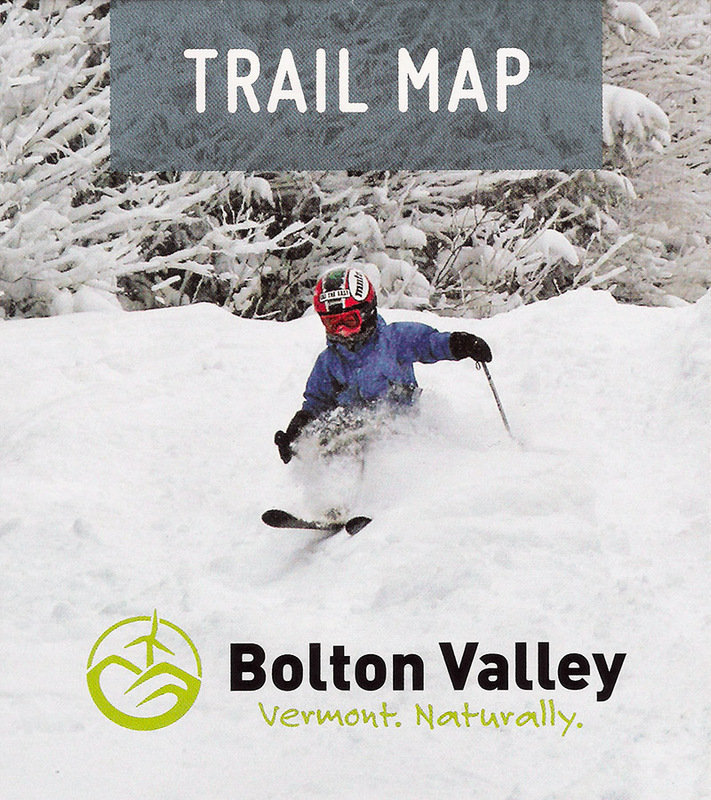 When I was up at Bolton Valley on Saturday, I glanced over at the trail maps and brochures near the front desk as I often do, and saw that the new editions were out. Upon closer inspection, I realized that Dylan was on the front cover of the maps – in a picture taken during our December 28th outing from last season. 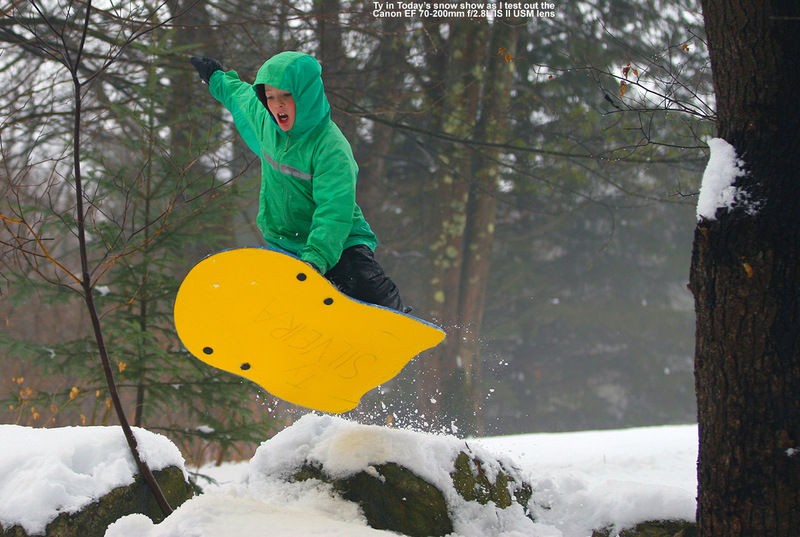 That was actually one of my favorite shots from the 2012-2013 season, as I was pleased with the snow, lighting, composition, and Dylan’s positioning, so it’s great to see that Josh and other members of the team chose it for the trail map cover. Ty kicked things off in the 2011-2012 season when he was featured in many ads and made the cover and interior of the Bolton Valley brochure, then last season the boys both made the covers of the map and brochure, and it’s great to see that one of their images was used again for the newest map. Congratulations to you Dylan on another cover shot! It pays to listen when Mom and Dad when they’re always telling you to keep those poles up and weight centered, and we appreciate all the patience that you and Ty have during the countless photo sessions each season. We’ll certainly be thinking of you each time we use the map this season! A strong frontal boundary has been draped across Northern New England for the past day or so, and this front is huge – it extends all the way up from the lower Mississippi Valley into northern Maine, New Brunswick, and beyond. On the south side of the boundary there’s lots of rain, and on the north side there’s snow and various forms of mixed precipitation. Here in Northern Vermont we’re really walking that line, and thus we’ve been treated to quite an amalgam of precipitation types. We had some snow on Friday morning, then some rain later in the day, which transitioned to freezing rain in the evening and overnight. Fortunately, the temperatures warmed up to around 40 F this morning, the precipitation shut off for a while, and indeed it was a wonderful morning to be outside. Naturally, the nice weather got me thinking about skiing. I didn’t actually expect to be doing any skiing this weekend with on all the messy precipitation out there, but the morning lull seemed too good to pass up. 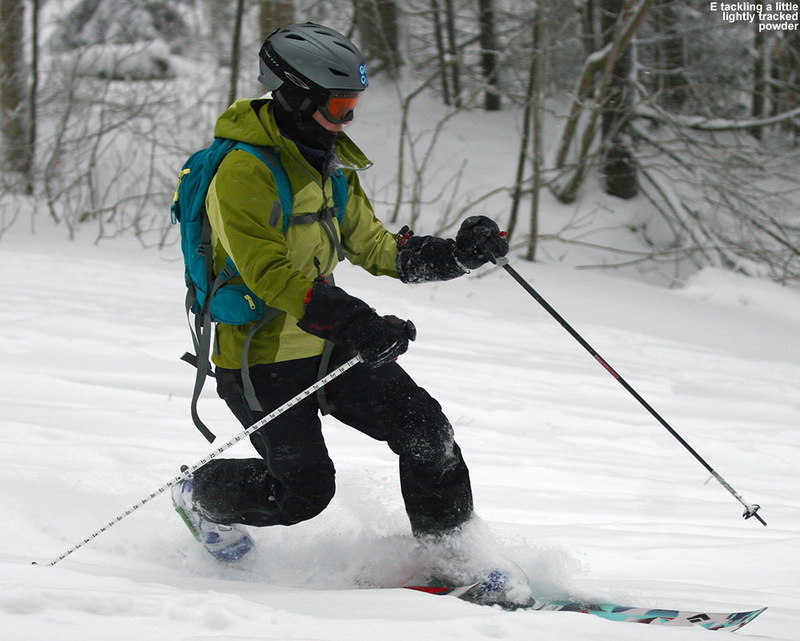 I checked the radar and saw that there was about an hour or so before the next batch of precipitation moved in, and that would be plenty of time to work out the legs for a bit on the Telemark skis. 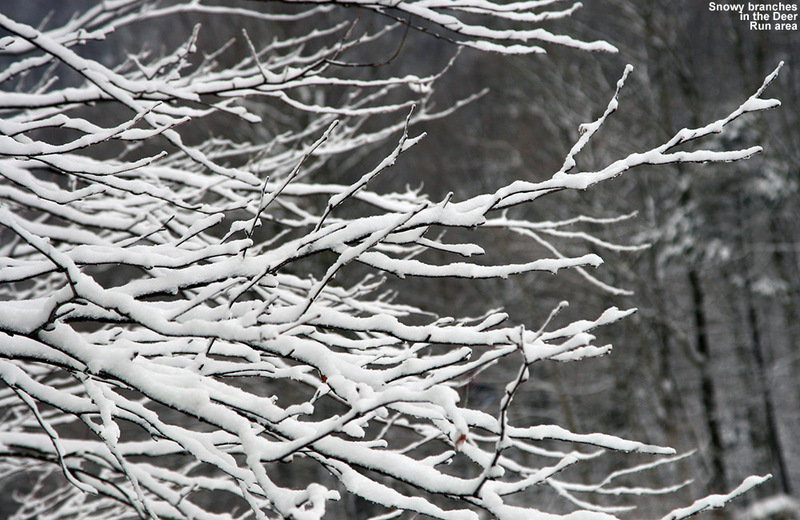 I also knew that the snow was going to be nice and soft, because the cold air has generally been in the valleys, and in fact the mountains have been warmer. The Bolton Valley Weather Station at 2,100’ was reporting temperatures in the mid 40s F, and that would definitely soften up even the toughest snow. I couldn’t convince anyone else to go up to the mountain with me, since the boys were having way too much fun sledding in the yard, and even with the lull in precipitation, E wasn’t thrilled with the weather situation. I had to go it alone, so at around 10:30 A.M. 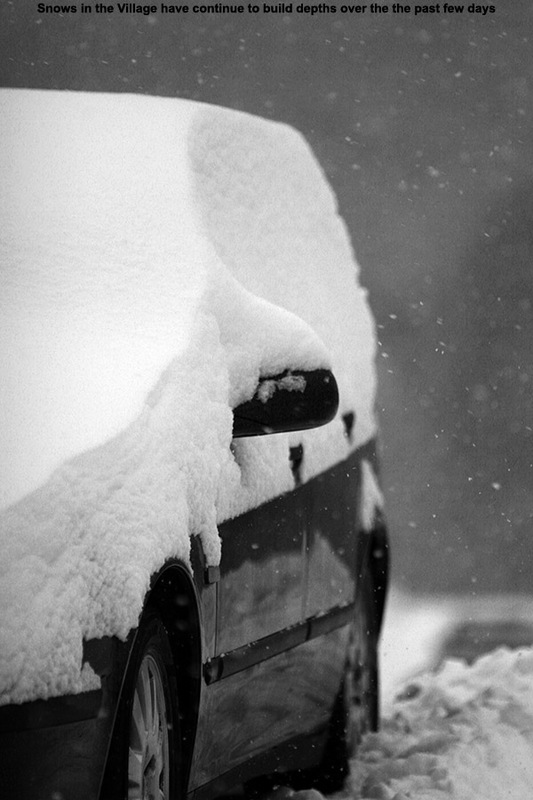 I got my ski gear together and loaded up the car. I was just about to drive out when I got a bit distracted. I saw the boys making runs on their sleds, and they were having a ton of fun. After we talked for a bit, we decided to have them head down onto one of the lower runs on our property that had a fairly large jump. My friend Chris has lent me his Canon EF 70-200mm f/2.8L IS II USM lens for some testing, and since we’re unfortunately past the fall soccer season, this seemed like the perfect opportunity to put the lens to work. Let’s just say that f/2.8 rocks, and even with only winter solstice light for my 30D to work with, I was able to get down to around 1/2000 sec at ISO 200. The boys put on quite a show, and I was able to capture some nice shots during the test. The boys were out really enjoying the snow today. 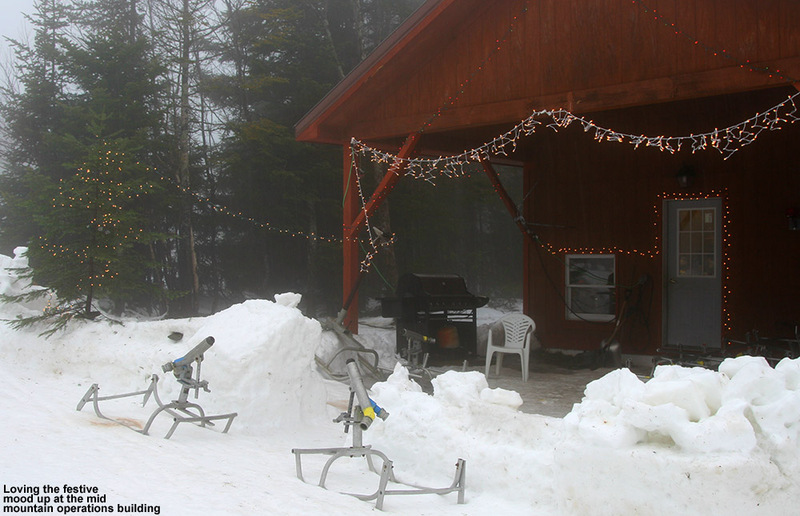 We probably spent an hour shooting sled jumps and putting the lens through its paces, and when we were finally done, I reassembling my gear and prepared to head up to the mountain. Within moments, it began to rain, and of course my weather window had closed. I had to wait until early afternoon, but eventually another window opened. It wasn’t as precipitation free as earlier, but it looked like it was going to be my best shot to get in some turns. Although I knew the weather was still warm up on the mountain, I wanted to get going – our temperature had dropped to 35 F at the house, and I didn’t want to have to deal with ice on the roads if the temperature dropped too low. As I drove west down the Winooski Valley, the temperature fell to 34 F in Bolton Flats, and finally 33 F at 340’ in Bolton, at the base of the Bolton Valley Access Road. The temperature hung there as I drove upward, and once I got above 1,000’ the temperature began to increase. 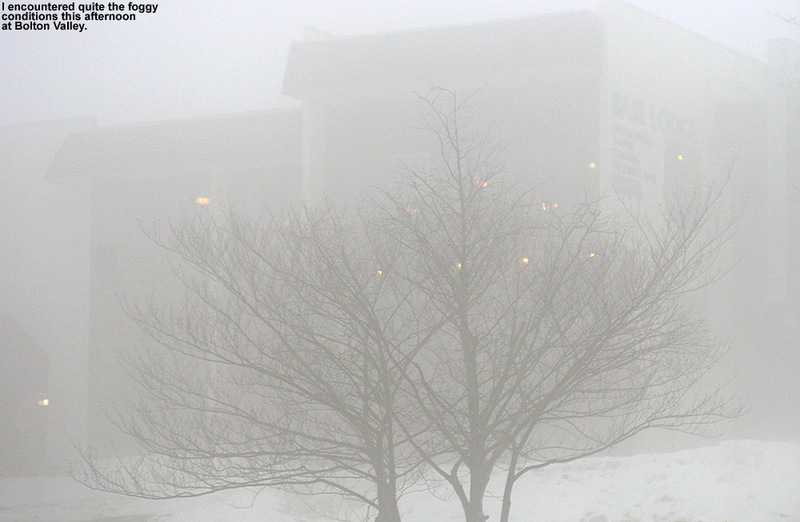 I proceeded to drive up through several very interesting bands of fog and clouds, and by the time I got up to the Bolton Valley Village at 2,100’, the temperature had risen into the low to mid 40s F. Getting out of the car felt like stepping into the bathroom while someone was showering. With low clouds and on and off light rain, it wasn’t surprising that just a handful of people were out skiing, but the snow looked good. I hopped on the Vista Quad, and headed down Spillway Lane for my first run. 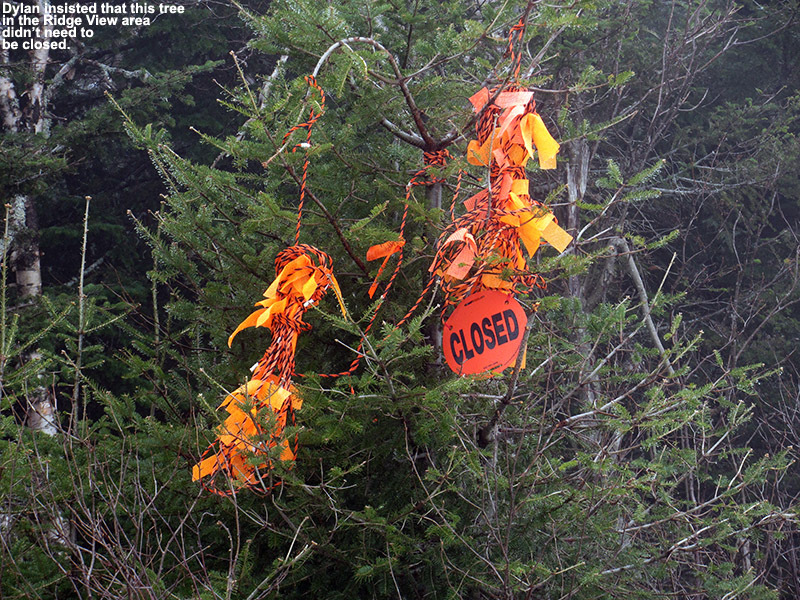 I’d heard that Vermont 200 and Schuss were open, but I found their ropes up as I approached them. The coverage didn’t look too bad at that point, although with the soft snow I’m sure that too much skier traffic could have been detrimental. I continued on the Sherman’s Pass route instead, finishing off with a good run down Beech Seal that had me working hard simply because of the low visibility. You really had to be on your toes because you could only see a turn or so ahead. Since Vermont 200 and Schuss were closed, on my next trip I took Alta Vista, and that was the run of the day. 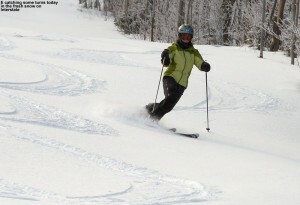 On the skier’s left, there was a beautiful mixture of soft manmade and natural snow, and the turns were great. Ty loves that area, so I wished he’d been there to ski it. It was good enough that I had to hit it again before I finished up, so I burned the legs for another round. The snow was soft everywhere, and the runs were skiing quite well, although if you ventured too far off the groomed runs into the natural snow it was mushy. You could also see that some of the natural snow trails were losing cover due to the warm conditions, and it’s funny to think that snow was probably melting up on the slopes more than down in the valley. 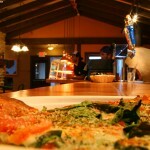 Since I hadn’t eaten lunch, I stopped in at Fireside Flatbread for a slice, and got to catch up with Josh Arneson. I told him I’d just seen the new trail maps with Dylan on the cover, and the picture was great. Not surprisingly, it was just me and a few employees hanging around, and it had that pre-holiday vibe. 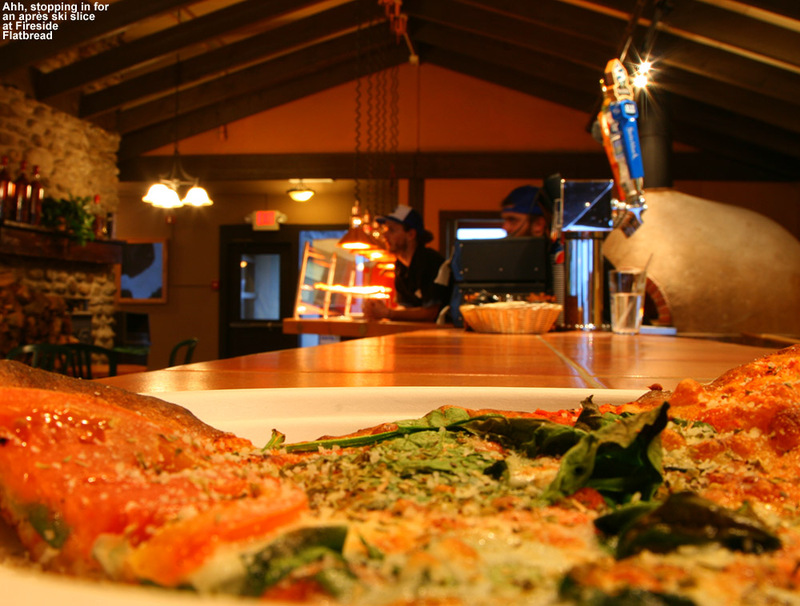 The pizza was great as usual – I went with a margherita-style slice. When I headed back down to the valley, the temperature had dropped a couple of degrees in the Village, and I found the same 33 F at the bottom of the access road. Things were definitely right on the border of freezing up though – when I stopped to gas up at the Bolton Store, the pavement at the gas station was in a half frozen/slushy state, and you could tell that it was on its way to hardening up. Back at the house, the temperature had dropped to 33.1 F, and it wasn’t long before we were back below the freezing mark. There’s the potential for more freezing rain tonight, so we’re hoping it’s minimal enough to not promote issues with trees and power lines. Even though this storm has been messy, it’s likely that many areas will get a net gain of liquid equivalent in the snowpack to substantiate the base. 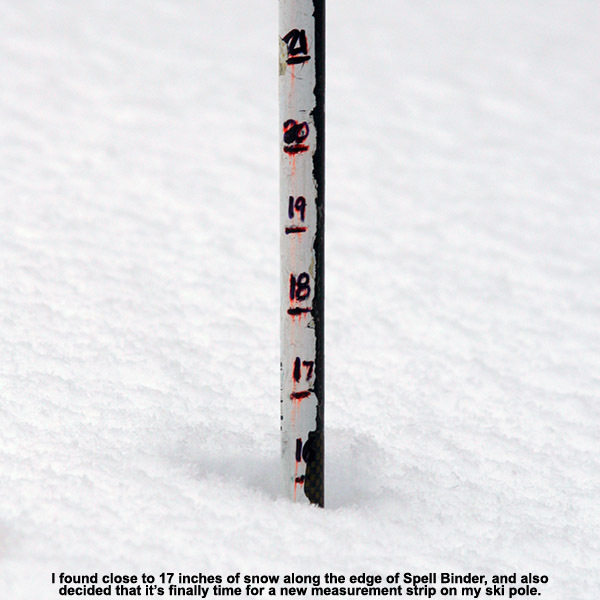 However, we’ll need additional snow to cover up the firmness when the mountain temperatures drop. I stopped in at Bolton Valley this morning to check out the snow and make some turns, eager to see how the Timberline area was doing. Up to this point I’ve only skied the main mountain, because the snowpack down at the Timberline elevations was just a bit too marginal. 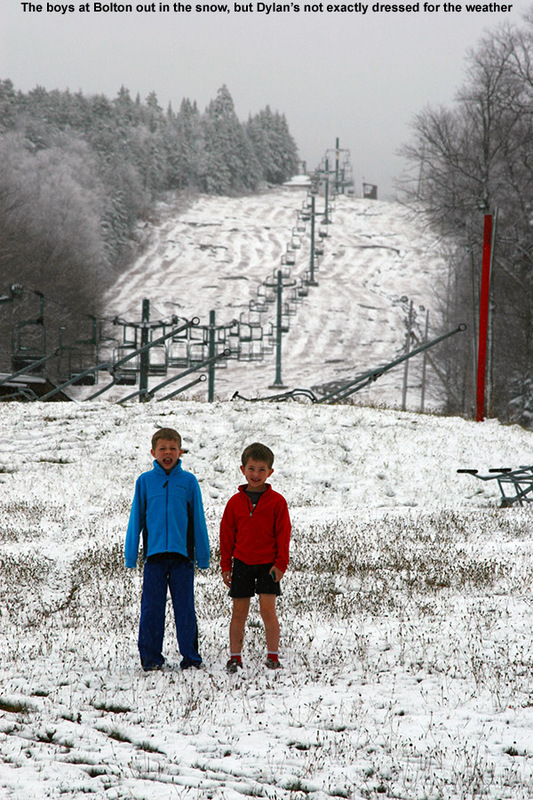 The snowstorm we just had over the weekend was fairly significant though, with close to a foot of snow for the ski resorts in Northern Vermont, and with additional small rounds of fluffy snow topping things off this week, I suspected that Timberline would finally be ready for some turns. Temperatures have warmed up significantly from where they’ve been over the past several days, and this morning’s valley temperatures in the mid 20s F were very nice. The shot of snow that we picked up this morning in association with a passing warm front had essentially dissipated by the time I was driving up to the hill, and I found just cloudy skies as I geared up for my ascent. Right off the bat as I began my ascent behind the Timberline Lodge, I started probing the snow to get a sense of the depths and consistency. I found roughly 10 inches of powder in undisturbed areas just above the lodge, and it was indeed nice, but it only had a bit of a density gradient to it. The more surprising thing was that there was little if any base below the powder. 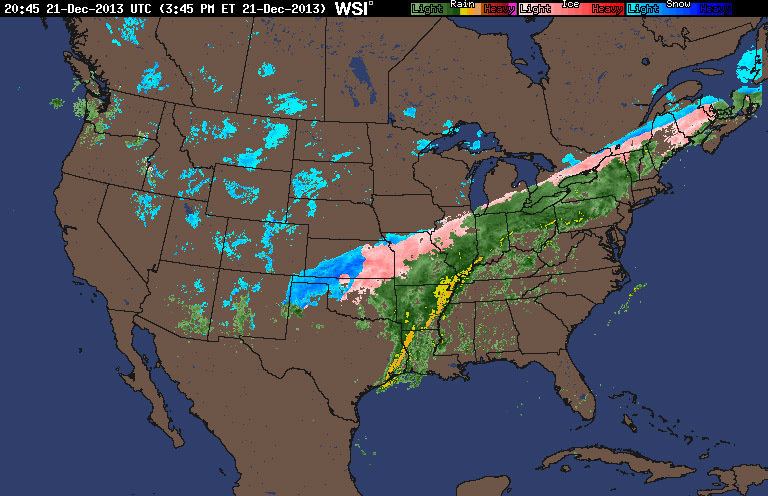 There must not have been much snow down at those low elevations before the weekend storm. I followed a nice skin track that took the typical route, wrapping around the lodge and heading up the skier’s right of Twice as Nice. 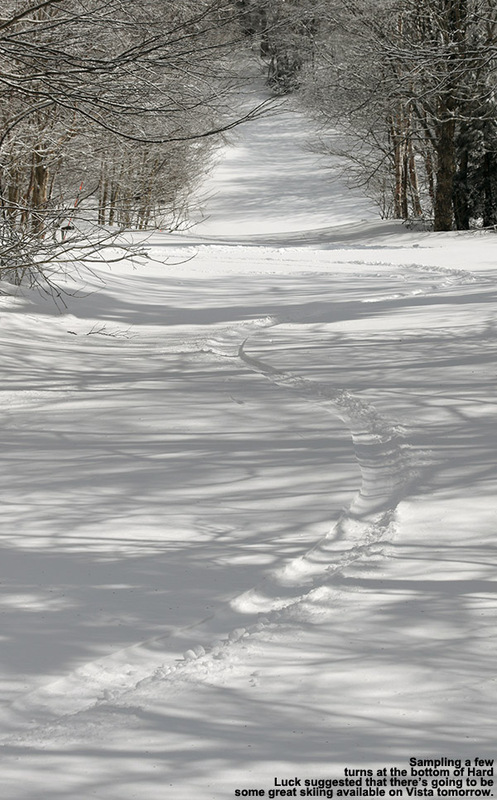 I saw some great-looking powder along the skier’s left of the trail which is more protected from the sun, but there continued to be little if any base along the skin track. That lack of base had me concerned, but once I was above 2,000’ it started to kick in even in the sunnier areas. 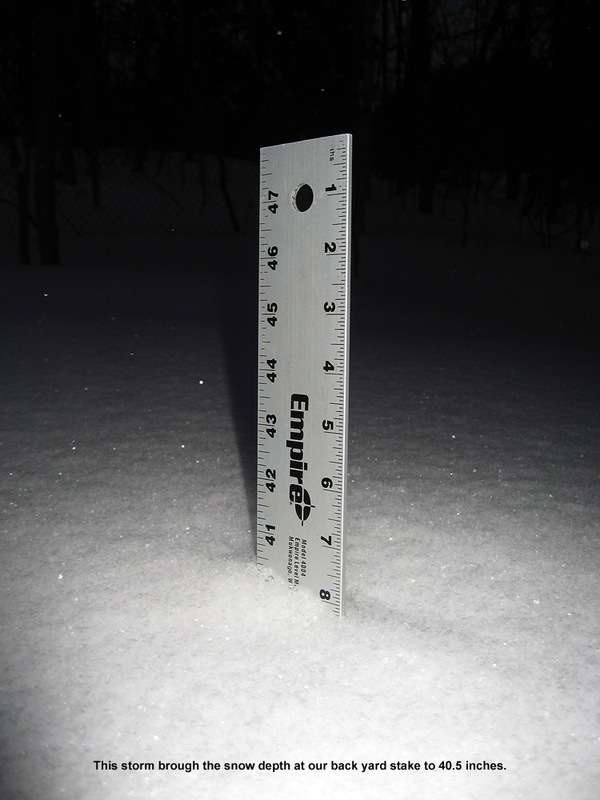 I was getting snow depth readings of roughly a foot above that level, and there were at least a couple inches of dense base snow. At the mid station I looked toward the upper section of terrain and could tell that with the wind, it wasn’t really going to be worth the additional hike. I traversed across to assess the descent options, and although the tracks on Twice as Nice looked good, Spell Binder looked a bit better. I switched over for the descent and side-stepped cautiously down the first 20 feet or so of the headwall. 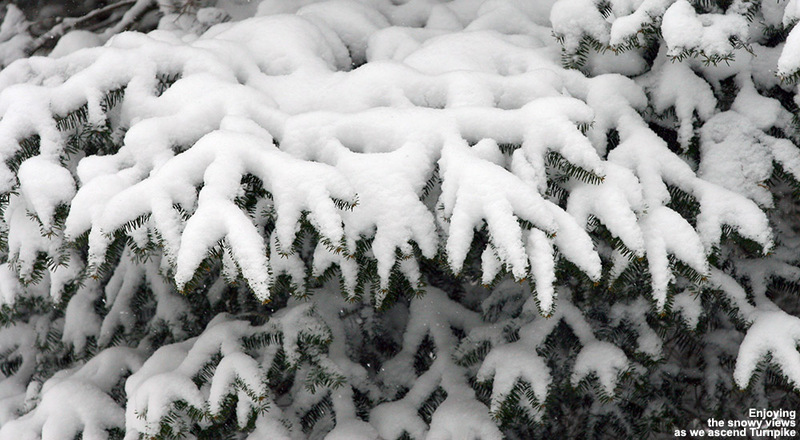 I could tell that the snow was thin in that area due to wind scouring, but below that it was much better. I had enough confidence in the coverage to ski the next section of the headwall, but I wanted maximum floatation just to be safe, so I set the AMPerages together alpine style, then schussed the next 30-40 feet of the headwall before dropping into Tele turns in the fluff along the skier’s left of the trail. 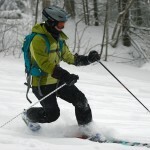 It felt like the perfect melding of alpine and Telemark technique, and dropping the knee into those lower turns was oh so good. I did a couple of depth checks along the edge during the descent, and generally found at least a foot of snow, with up to 17 inches in one of the deeper spots. 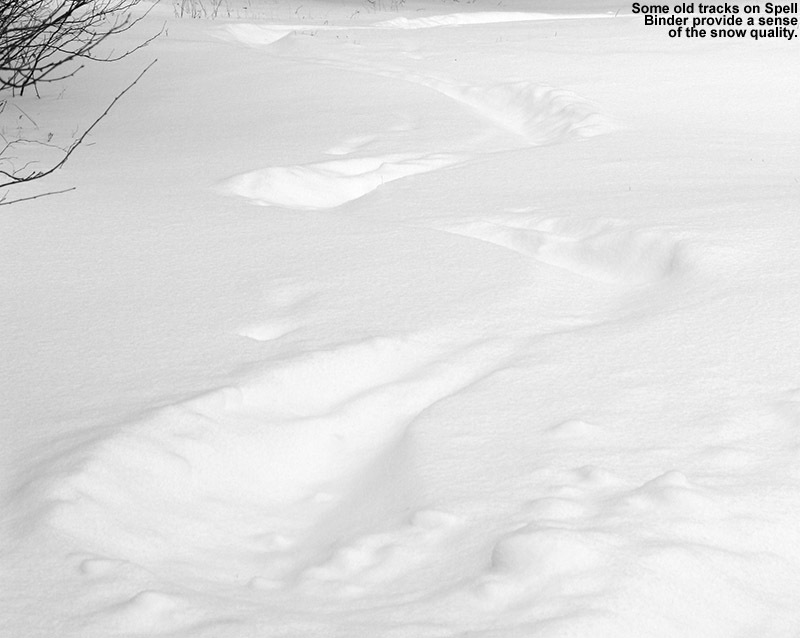 The powder there had that fantastic density gradient that delivers great turns. 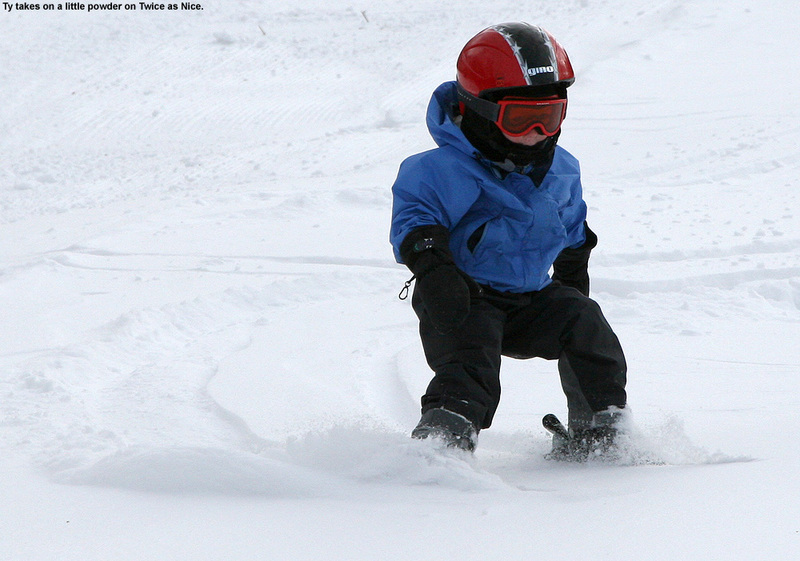 As is often the case, the Timberline area has managed to deliver some of the finest turns of the season so far. Down at the car, I ran into Brian, one of our graduate students, who was also catching a morning ski constitutional before heading to work. He’d taken Twice as Nice, and said that he had to be on his guard at times. He’s bigger than me, and his skis weren’t quite as wide as mine, but based on our conversation I think I’d give Spell Binder the nod on conditions. Temperatures warmed up to around the freezing mark down in the valley, and that felt nice. We’d supposedly got a big storm, or series of storms coming through the area this weekend, and although there’s going to be a lot of mixed precipitation, it could be a good snowpack builder as well. We’ll just have to see how it plays out. 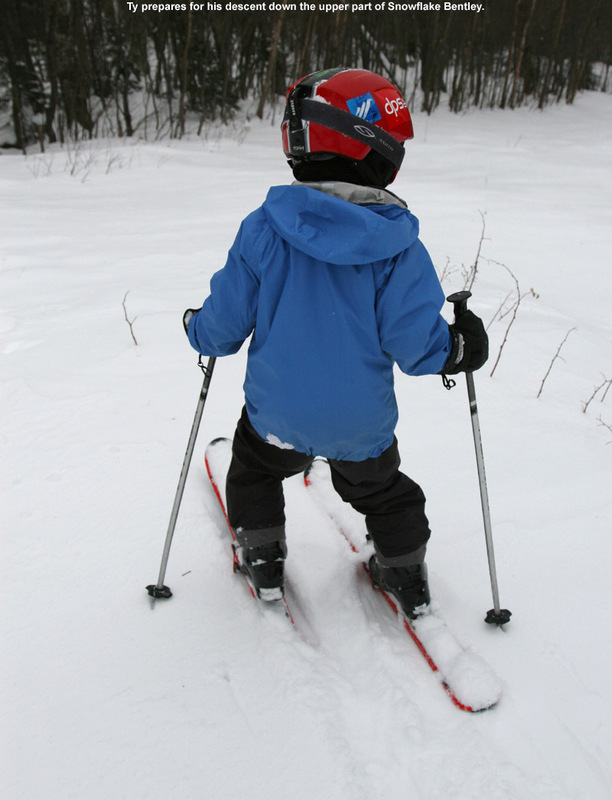 Yesterday E had her training day for our school’s ski program at Stowe, and boy was it cold – it was below zero F for the entire morning. I’d sent E off with plenty of hand and foot warmers, and she made use of them. She actually cracked the lens in her goggles toward the end of the morning, but by then everyone was just about done anyway. I don’t think there were many takers for afternoon turns once the requisite training items were covered in the morning. Things were a little different for my training day today – temperatures were rising through the teens F, and oh yeah, there was a bit of a snowstorm in the intervening period. 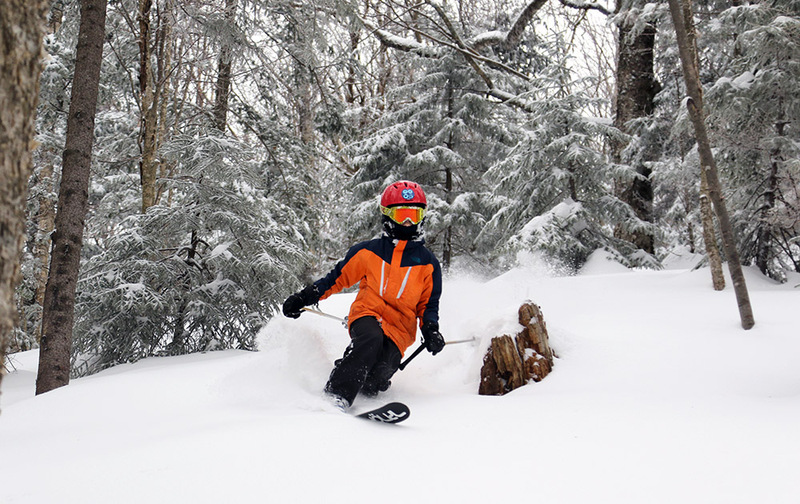 This storm was one of those that comes out of the Ohio Valley and redevelops off the New England coast, and it brought up to 19 inches of new snow for the Vermont ski areas. 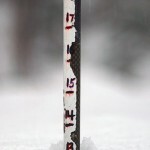 Snowfall totals were a bit lower for the Northern Vermont ski areas, generally approaching a foot, but as my snow analyses had shown, there was plenty of liquid equivalent in the snow; as of this morning, we’d picked up close to ¾ of an inch of liquid in the snow and the density was close to 10% H2O. The snow was of course quite dry with the cold temperatures in the area, but it certainly wasn’t fluff that might be prone to blowing away. 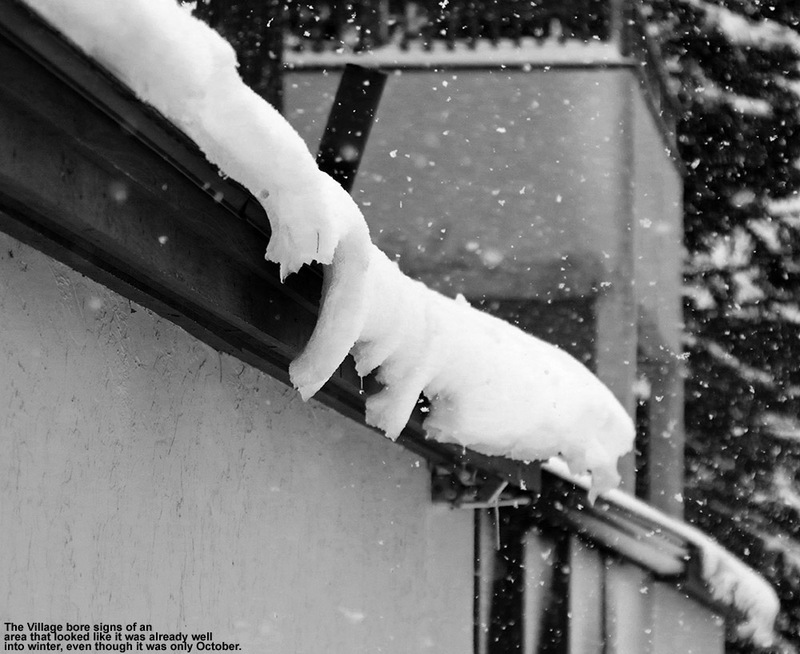 “The snow depth at the Mt. 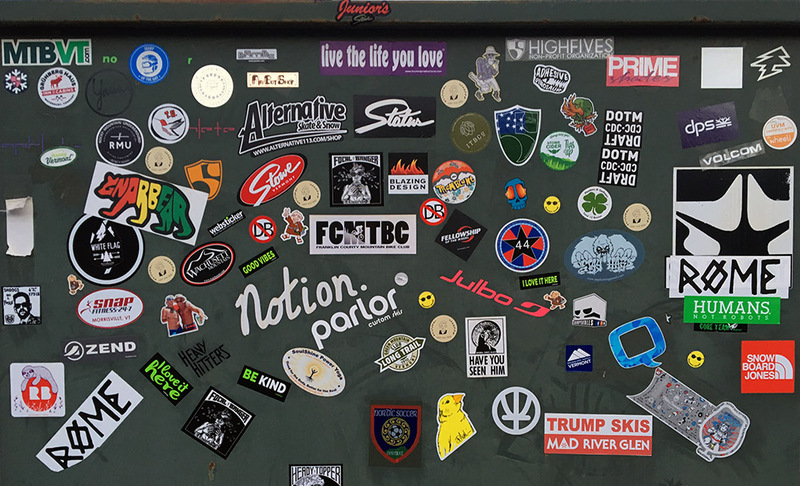 For today’s training session, Claire assigned me to the level eight group, and when the instructors were dividing up the trainees in that group, they further broke them up by those who had already skied five days or more, and those who hadn’t. Although I’d yet to ride a ski lift this season, I’ve been out several times already, so I joined the former group, with Steve as our instructor. 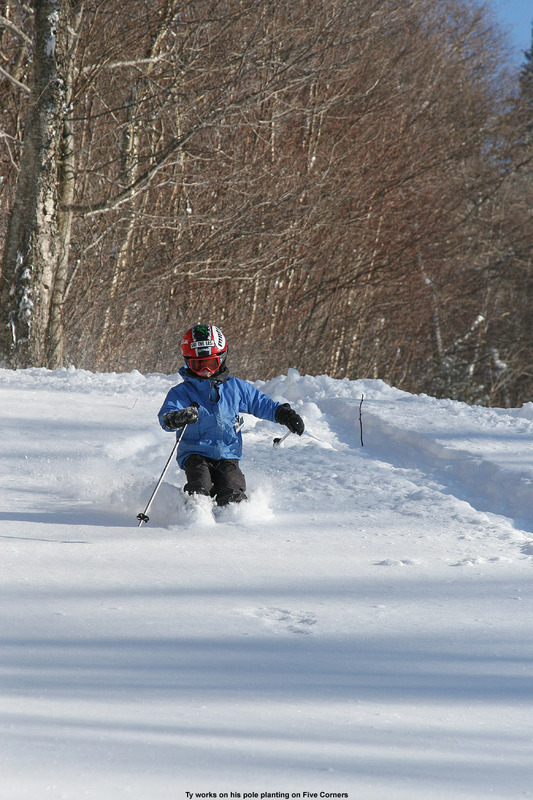 With all the new snow, Steve’s plan for the day was to let us ski a lot. 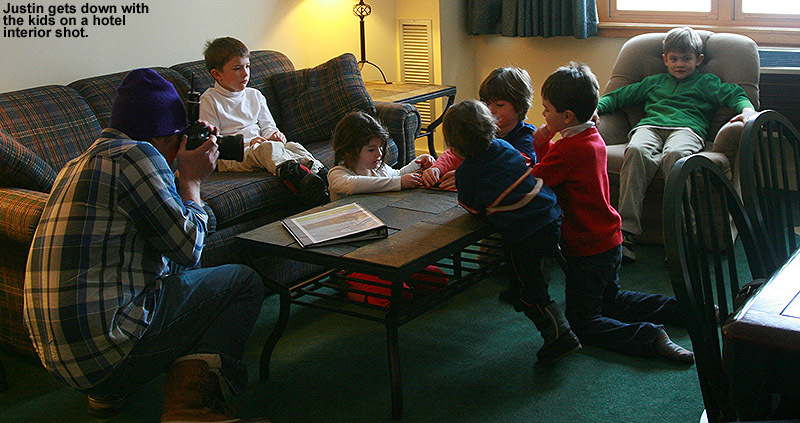 Instead of working on drills, he wanted to work on group management (i.e., how do the coaches effectively manage their groups of students on the slopes) in between the skiing. This was actually a nice change of pace, since E and I have had plenty of sessions with drills for both us and the students over the past few training sessions. One new group management technique that I learned today was for brining the kids into new areas of trees. What Steve likes to do is to show the students the entrance to the glade, but instead of entering that first time, he goes around to the exit of the glade via the trails. That way, the students know what is in store, and are ready with a little more directional orientation for when they actually do ski the glade. 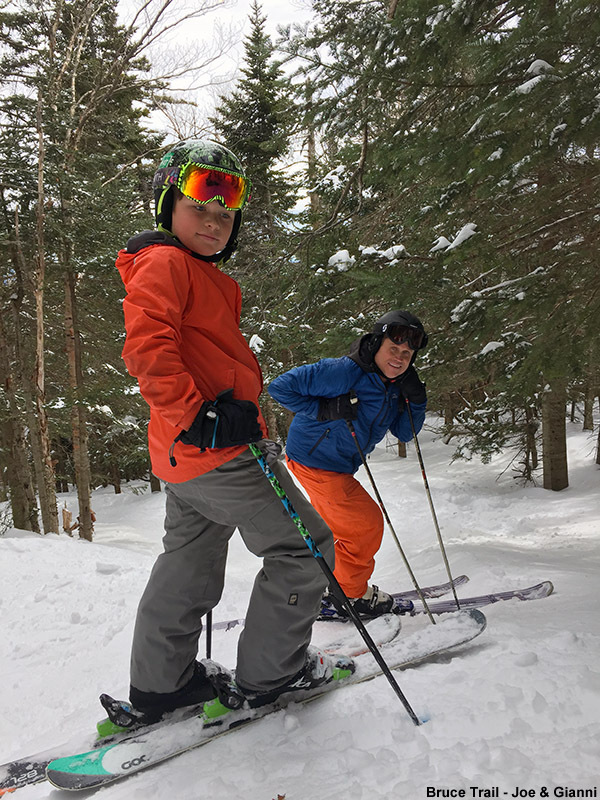 We talked a lot about strategies to use when bringing the kids into the trees, and it was a good fit for the trainees in our group, because many worked with the advanced students and were indeed doing a lot of off piste skiing. Steve also worked on the partner strategy for ensuring that everyone is accounted for at each stop. 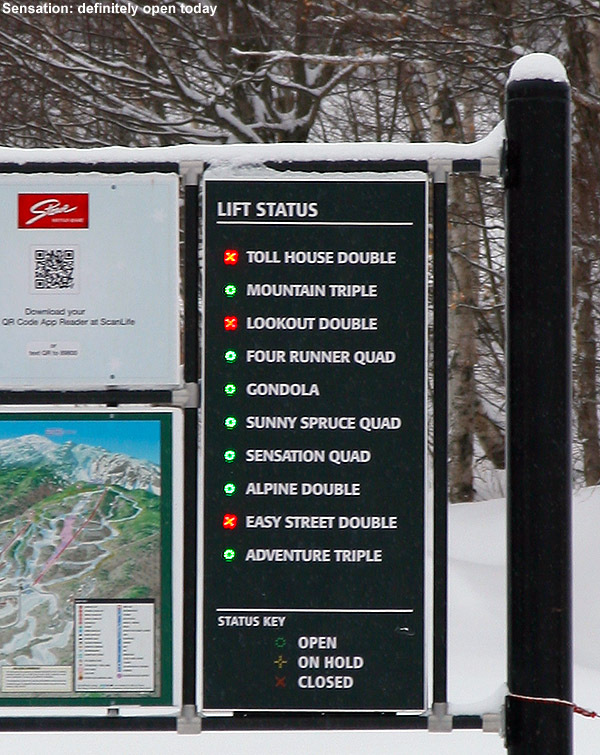 We actually had a real-time demonstration of its effectiveness, since my partner John had misheard our lift destination on one run and ended up at the Gondola instead of the Fourrunner Quad. Since we knew he was missing, I was able to run over to the Gondola and retrieve him. 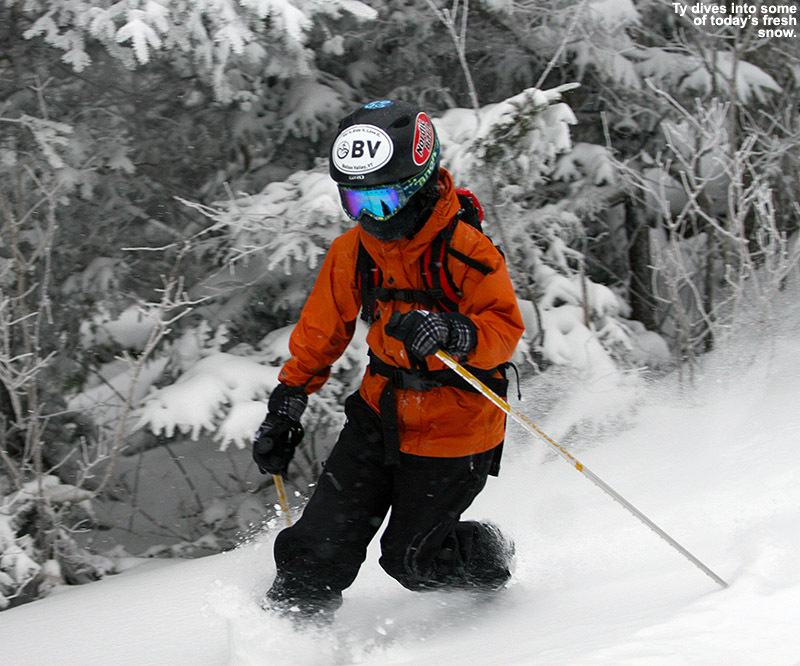 In terms of conditions, naturally they were best early on – we had a couple of great runs down Perry Merrill with good packed snow, and chowder and powder off to the edges. It was nice that Steve just let us rip it up. 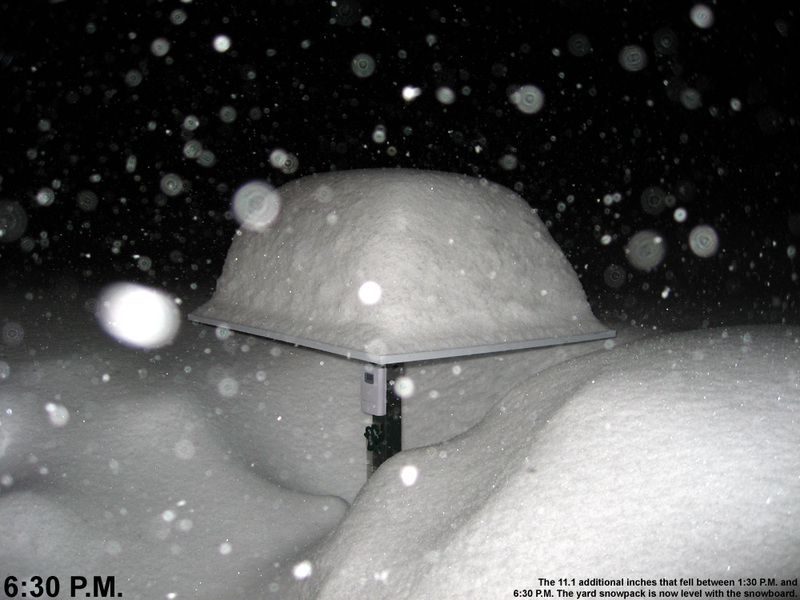 I generally found 12” of powder whenever I looked in undisturbed places, which is presumably the combination of snow from this storm and that frontal passage the other day. 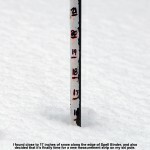 The snow depth at the Mt. 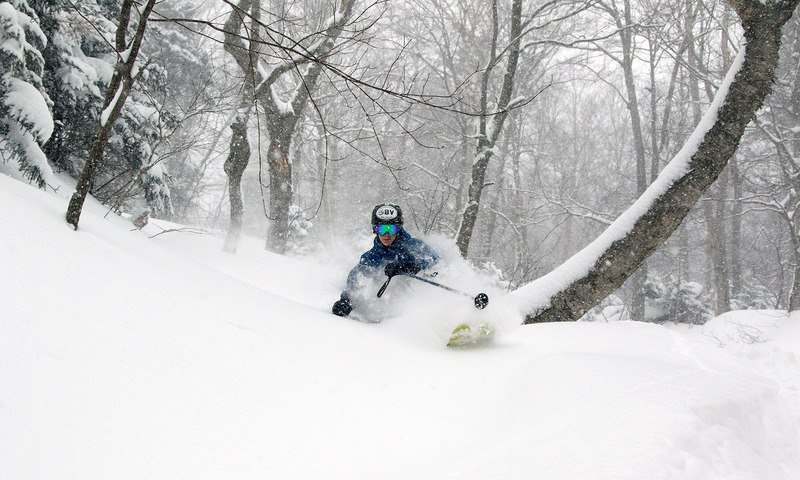 Mansfield Stake isn’t quite to that 24” mark yet (22” as of this evening’s report), but people are definitely starting to ski those appropriate areas of early season trees. 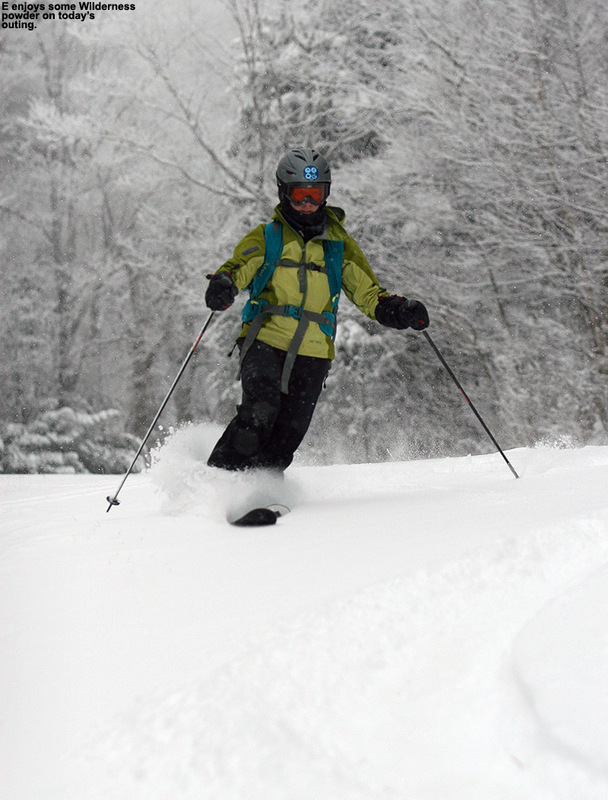 During today’s session, Steve brought us into Sunrise Glades, Birch Glades, and Lower Gulch Glades, and they were all in pretty good shape. If you were going for lines of fresh powder, you wanted to be on your guard a bit since there are still some obstacles about, but in many spots it was hard to tell that it was so early in the season. In areas that had seen skier traffic and had packed snow, you could just ski it and really didn’t have to worry about coverage issues. In any event, it was definitely nice to be back in the trees. Indeed those runs listed are the more moderately pitched, well maintained glades that are amenable to these earlier visits, but they’re very low on the mountain and that says a lot about the current state of the snowpack. After some lunch and paperwork at the Great Room Grill, Steve said that we were done, but that anyone who wanted to could meet with him at 1:00 P.M. and work on identifying weaknesses in student’s ski technique and how to remedy the situation. Having done a lot of that over the past few sessions, I decided I’d just grab a pair of my Tele skis from the car and take a final run or two before heading home. I was just going to grab my mid fats and head back over toward the Chapel Glades, but then wondered if the Sensation Quad was open – if it wasn’t, it might be a nice place to earn some turns. With that in mind, I grabbed the fat boards off the rack, finding everything covered in a layer of new snow that had fallen during the morning. 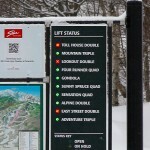 Once I checked in at the lift status board at the Spruce Peak Base, I saw that indeed the Sensation Quad was running. That meant that the terrain over there on Spruce would likely be pretty packed out, but I decided to just go for it instead of making yet another trip back to the car. I took a trip up the Sunny Spruce Quad and made my way over toward the base of Sensation. There were actually very few people over in that area, but in terms of traffic, the damage had been done earlier in the day. 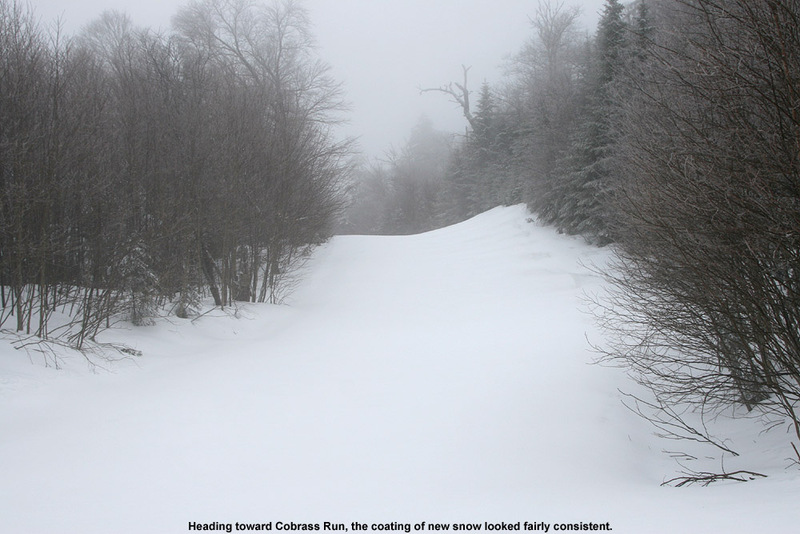 There were still pockets of powder off to the sides of trials, but with Main Street closed for snowmaking, terrain was limited. Even the hiking terrain above the top of Sensation was tracked up, so people had clearly been doing what they could to get some powder with the limited acreage that’s currently available on Spruce Peak. 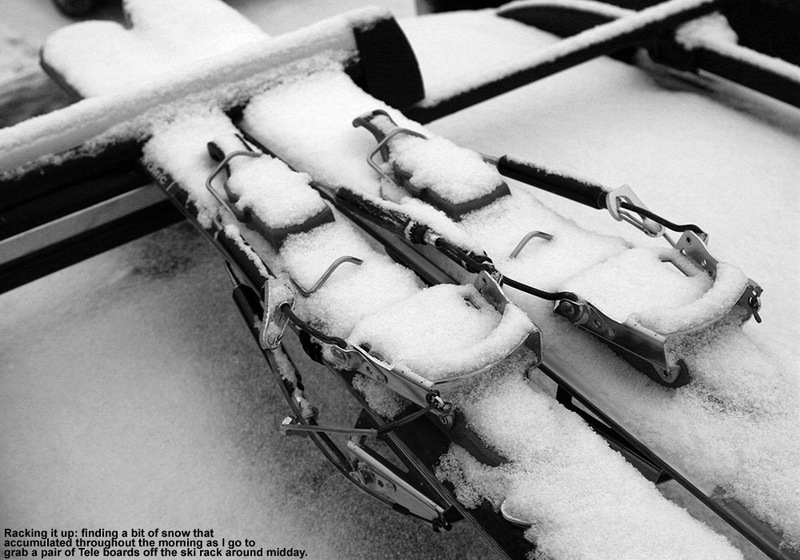 In spots where the snow surface was down to manmade snow, the fat skis were definitely a poor tool for the job. I ended up just going with alpine turns in the areas where the snow was firm like that, because getting the fat skis on edge in a Telemark stance in those areas felt like trying to get a snowboard on edge on icy terrain. They’re just not meant to do that well. 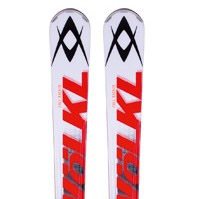 I will say that I notice the deficiencies of fat, rockered skis much less when I ski them alpine, so that may be one reason that so many people are willing to use them as more all around skis (or they just go in with the recent marketing trends and figure that’s the way it is). With my legs cooked from the morning’s runs, I was very ready to call it a day after that trip to the bottom. I really would have liked to venture over to the snowfields above Meadows for some powder, but they had that area roped off because of snowmaking below. 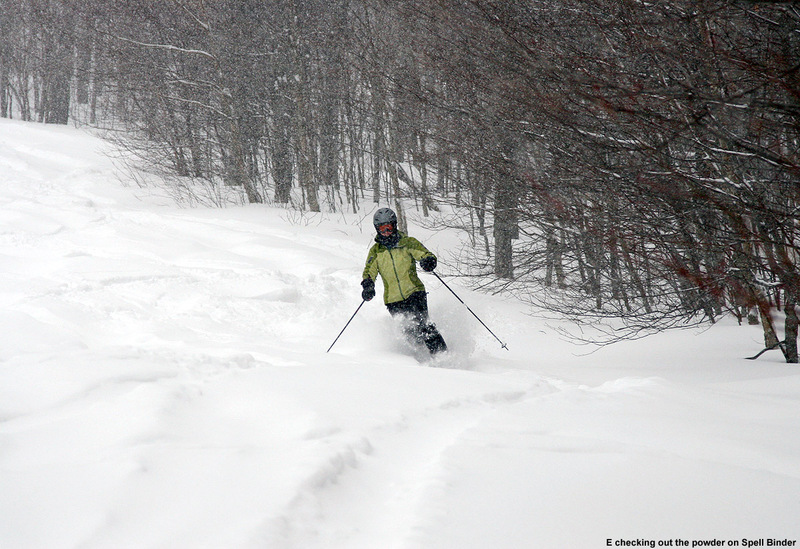 It was looking so good in there with the tracks from when it had been skied – hopefully I can get in there on my next Stowe powder day. The ski tour we took yesterday was certainly considered a success, since both E and Ty were saying positive things today, and Ty was expressing to Dylan that he missed out on some fun. With the prospects for a little more snow today from a passing Alberta Clipper, I figured another visit to the mountain was in order, and I decided to make it at the end of the day once the new snow had started to accumulate and top off the powder. I couldn’t quite convince anyone else to come with me since they were having too much fun sledding or doing other stuff, so it was another solo outing. I wasn’t exactly sure when the snow was supposed to start, but eventually it looked like I was going to run out of light, so around 3:00 P.M. I finally headed out. Fortunately, flakes had just started falling in the valley, so I knew the snow would already be well underway up on the hill. 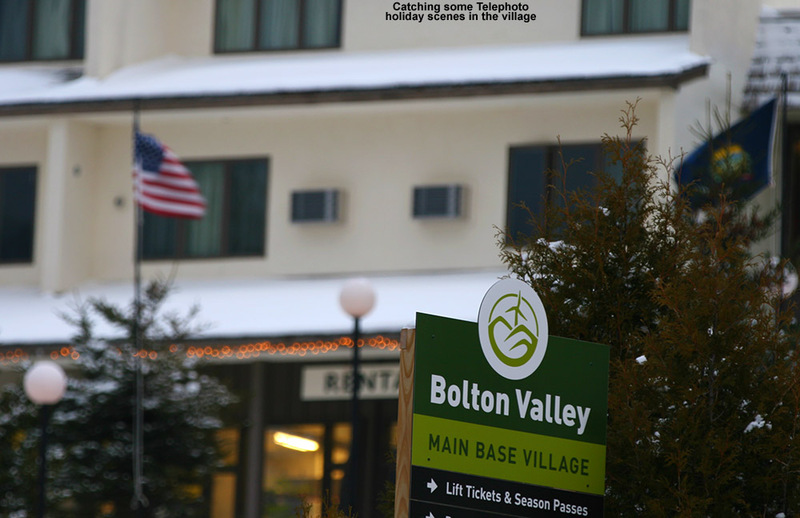 Up at Bolton Valley, the temperature in the Village at 2,100’ was 30 F and a steady light snow was coming down. The flakes weren’t huge, but it was accumulating on my equipment quickly enough that gear left out took on a coating within a minute or two. After using Turnpike for the past couple of ascents, and seeing that skier traffic there had been decent, I decided to go for an alternative ascent route up through the Fanny Hill area. It would give me a chance to check out the skiing in that area, and still head over toward the Wilderness Lift Line if I didn’t find anything that seemed to top what we skied yesterday. My first interesting sight was right as I was starting my ascent on Lower Fanny Hill – on one of the small cross trails there was a group of folks hanging out in a protected nook in the trees, just sitting in a circle of chairs and chatting. I suspect they were from the Liftline Condos that were just beyond. There was no wind, so with the light snow falling and temperatures around 30 F, it was indeed a fun time to be outside; it just seemed like a fitting thing to be doing on a dark Sunday afternoon in December. I continued up toward Upper Fanny Hill, generally staying away from the Sherman’s Pass area where I could hear the snow guns running. 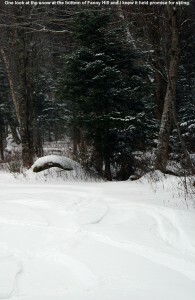 Those higher trails like Coyote, Work Road, Lower Crossover, and Swing, held deeper snow and had seen much less traffic. They were definitely going to be on my descent route. I stopped my ascent around 2,900’ on Upper Fanny Hill just before the steepest pitches, because I could see that they were somewhat windswept and just didn’t have the coverage they needed yet. I played it by ear on the descent, just watching for those trails with deep snow that had seen minimal traffic. 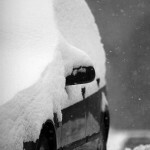 Fanny Hill ultimately lost out to Work Road because the snow was just too good – 6 to 8 inches of fluff and hardly a track. That brought me over to the Wilderness Lift Line, and since we’d skied the skier’s right yesterday, I took the skier’s left today and found the same type of good snow. I’m sure Fanny Hill would have been fine as well, but after committing to Work Road I went where gravity took me. The rest of the descent back to the Village was just like yesterday, good soft snow, so no complaints. It was getting pretty dark when I was leaving, but the group of folks was still hanging out in their little alcove in the trees – it was a good spot. 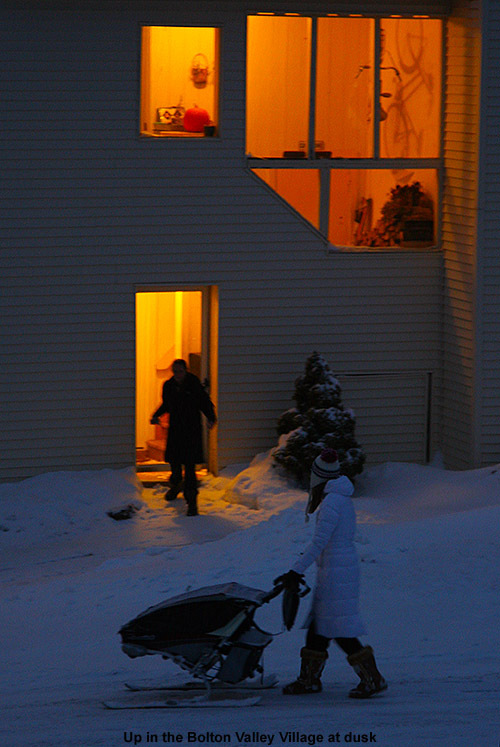 As I made my way along some of the Liftline Condos, I saw a woman pushing something along through the snow – she made her way through some of the deeper snow around the back of the condos, and then was out of view for a bit before she got onto the street and I could get a picture I didn’t know if it was a stroller, or just some other sort of vehicle for moving things, but whatever the case, the fact that it was on skis was intriguing. Clearly it seemed to be somebody who knows the Bolton Valley environment. It snowed all the way down to the valley when I was heading back to the house around 5:00 P.M., and the temperatures had fallen below the freezing mark even at the bottom of the access road down at 340’. It looks like the next opportunities for snow are some light stuff in the early week, and then a frontal system later in the week.